Review posted October 8, 2016. This is the first book I'm reading as a 2016 Cybils first-round panelist for Young Adult Speculative Fiction -- and it bodes well that this whole reading experience is going to be tremendously fun. But let me say right up front that while these are Blogger awards so I am allowed to talk about what books I like -- please be aware that I am only one member of the judging panel, and I will write reviews before I've talked with any of the other judges. So only my opinion is expressed. On top of that, this is the first book I've read for the Cybils this year, so I can't even compare it with the competition yet. I hope the competition will be tough! So I will simply express that I loved this book -- but that doesn't necessarily mean it will be a Finalist. That said, I did love this book! The premise is exceptionally fun. It's alternate history, during a very turbulent time in England's history -- with shapeshifting thrown in. Pay attention. We've tweaked minor details. We've completely rearranged major details. Some names have been changed to protect the innocent (or not-so-innocent, or simply because we thought a name was terrible and we liked another name better). And we've added a touch of magic to keep things interesting. So really anything could happen. This is how we think Jane's story should have gone. Instead of Edward dying of Consumption (or The Affliction), he's dying because he's being poisoned by his closest advisor. The part I like best though is that instead of conflict between Protestants and Catholics, there's conflict between Verities and Eδians ("eth-ee-uhns"). "The Eδians were blessed (or cursed, depending on your point of view) with the ability to switch between a human form and an animal one." That form is fixed for any individual Eδian. King Henry VIII took a lion form and had a bad habit of eating people who brought him bad news. But my favorite thing about this book is the character of Jane Grey. More than anything, she loves to read. Because of this, she has an encyclopedic knowledge of many different subjects. And she's not conventional. At the start of the book, as part of a plot to take over the throne of England, King Edward's advisor, Lord Dudley, tells Edward he's dying. They need to marry off Edward's cousin Jane quickly so that she can produce an heir before he does. So, in a few days, Jane is to be married to Lord Dudley's son Gifford -- and nobody bothers to tell Jane ahead of time that during the day, every day, Gifford is a horse. We've got plots and counterplots and people changing into animals at inopportune moments. But there's also romance and a whole lot of humor. If the sensibilities of the people involved seem a bit modern -- well, the narrators make that fun. 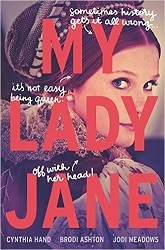 I'll go ahead and tell you that Jane does become Queen of England for nine days. But that's about all that matches the history we know. What does happen is an entertaining adventure and tremendous fun. The story is told from three perspectives -- Jane, Gifford, and Edward. So I'm not sure if the three authors each took one perspective -- they do sound pretty much alike. Though that's fair because the voice is always that of the narrators. The narrators give things a modern twist throughout, with plenty of humor and perspective dashed across it all.